According to one fairly widespread (and recently much in vogue) theory about the Euro crisis, Germany bears a large part of the responsibility for the current mess. The view is met with a variety of responses inside the country, ranging from horror to amazement. Naturally, if the argument were simply about the way Angela Merkel has handled the crisis – no Eurobonds, no debt forgiveness, systematic fiscal austerity – then possibly some of it could be understood. But no, things go beyond that, Germany has been too successful, too competitive, and this has presented a big problem for its partners who simply haven’t been able to keep up. This deeper “German bad” argument can take a variety of forms. The country is said to be obsessed with austerity even though all its partners are struggling to find air, it is thought to be guilty of running excessively large current account surpluses, it is accused of not showing sufficient solidarity with its south European partners by being unwilling to run higher inflation: what is more it is said to have benefited from a kind of vendor financing procedure during the good years and then complaining when the customers can’t pay. The list is a long one. The UK economist Simon Wren-Lewis even accuses them of having attained their hegemonic status simply by undercutting everyone else. The questionable status of this version of events was highlighted once more last weekend in a blog post by Paul Krugman (who has been little short of prolific in his tirade against what he considers to be the bastion of theoretical stupidity in Berlin – The Harm Germany Does, More Notes On Germany, Sin and Unsinn, France 1930, Germany 2013, German Surpluses: This Time Is Different, Germany’s Lack of Reciprocity, Europe’s Macro Muddle (Wonkish), Germany’s Sin ). Personally, I think that behind this whole approach there lies a major misunderstanding about just what is going on in Europe (dare I use the word “confusion”). 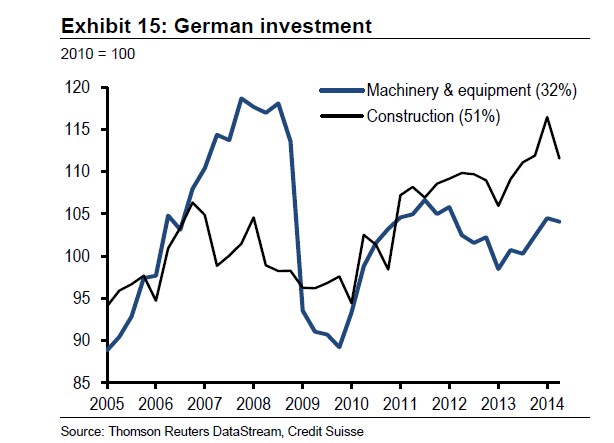 Why is the Germany economy falling back towards a possible recession? Why does a country which recovered so rapidly from the global recession in need itself of stimulus? What we need to look at is why it is that Germany itself has problems. Why it looks so much like Japan, and not the extent which it could be blamed for the obvious economic problems in Italy and France. Instead of crying to the heavens about the country’s current account surplus why don’t we ask why domestic demand is so weak. Surely not because the country is living through a “balance sheet recession”. 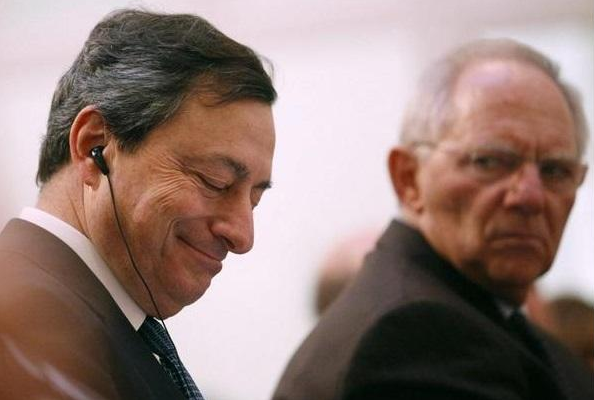 The argument we are being served up seems at best simplistic: Draghi is good, Schaüble is bad. That may be fine for those of you who like your world polarised in nice Manichean fashion, but would that things were so simple. I just spent a good deal of time writing a blogpost – The Japanisation of Europe – which tried to argue that Mario Draghi is understating the extent of the mess Europe is in, and detailing the shortcomings in his knowledge of what actually happened in Japan. I am no admirer of the intellectual corner Herr Schaüble finds himself in, but I can’t help feeling there is a significant element of “good cop” , “bad cop” going on here, with everyone defending the script they’ve been allotted, still if you like your stories nice and simple…..
What worries me isn’t the idealisation of Mario, nor the demonification of Wolfgang, no it isn’t that at all, it’s those five little words Krugman uses: “it’s by no means clear”. This vagueness worries me since it rings a bell in my head about a phrase he used on an earlier occassion: Japan’s “economy won’t always be in a liquidity trap, or at least it might not always be there.” (Monetary Policy In a Liquidity Trap). For someone who wants us to draw the conclusion that it’s the other side who are confused this vagueness is a bit rich. Does the policy he is advocating work or doesn’t it? I think the guinea pigs have the right to know before giving their permission to the experiment? You see, it wouldn’t be so bad if there were strong grounds for thinking that full blown QE might shock the Euro Area out of its secular stagnation, but as I’ve been arguing for some time now (see my Paul Krugman’s bicycling problem) the logic of Paul’s argument (that secular stagnation is ultimately the result of long term fertility trends, and the long term natural interest rate may well be permanently negative) leads to the opposite conclusion: that it probably won’t. And growing evidence from the application of Abenomics in Japan seems to confirm that view. To quote Martin Wolf again, “you can’t print babies”. There are lots of things wrong with the Euro Area and it’s institutions, and much needs to be done, but sending 18 countries on an experiment with consequences that wouldn’t be benign and might not work doesn’t seem like exactly the best way forward if you’re not sure about what you’re doing. Not Simply An Export Model, Germany is the most Japanised of Europe’s economies. Simply cutting wages in the south isn’t the answer (although carrying through a more serious internal devaluation involving reducing both prices and wages might be if you want to hold the Euro together). 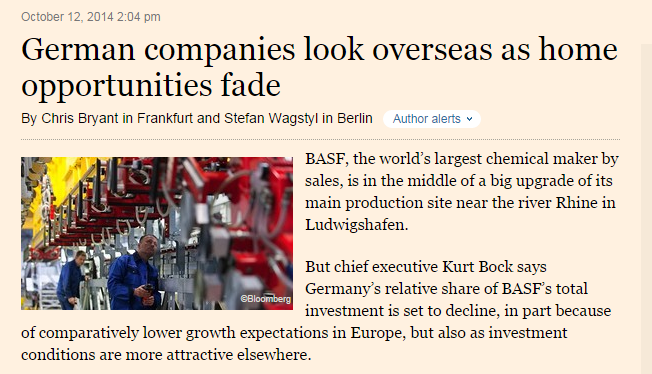 But neither is making Germany less competitive. High savings relative to investment is exactly the argument Krugman uses to explain demographically driven secular stagnation: there is insufficient capex as a result of weaker domestic demand. So German savings are a symptom of something, and that something needs adequate diagnosis. Even a cursory examination of German growth rates – the trend is now down to around 1% – suggests that all is far from well, as do the constant relapses back towards recession. The country simply looks good because all its partners are doing so badly. What southern Europe needs is a revolution in the mindset and more “better quality” stuff, and no amount of blaming Germany for the situation can get over that. The extractive networks who hold back growth need reforming out of existence. At the same time the under-investment over-saving phenomenon that characterizes Germany bears a remarkable similarity to what has been happening in Japan, with the strange difference that these days Japan is normally sympathized with and not blamed for all the world’s ills. The Japanisation of Europe is most evident in the creeping stagnation in the so called core, and above all in Germany. Germany could probably help more with its short term fiscal stance, as Mario Draghi is arguing, if the others had a clearer plan, but at the moment the reform impetus in countries like Spain – unemployment still around 27%, a 3% fiscal deficit in Germany won’t shave much off that – is waning severely. Shock measures to address this “unacceptable” unemployment is being neither contemplated or nor even discussed. 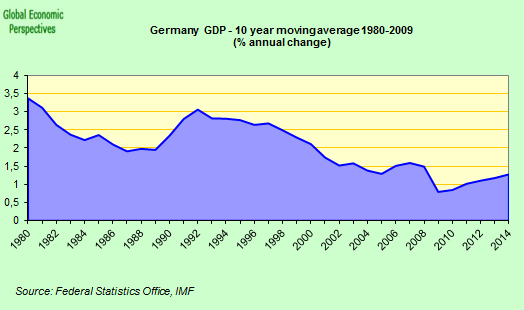 But the idea that Germany is stagnating on a temporary basis is absurd. It has been sliding to where it is now for over a decade, and short term stimulus won’t be any kind of game changer. Nor are structural reforms likely to make that great a difference, the country has already done a lot of those. They slowed the process down – which is what structural reforms can achieve – but they couldn’t halt the inevitable. You can either argue that Germany goes “full Japanese” and tries live on permanent fiscal injection steroids (which clearly the country never will because that is not what its citizens want) or you can accept that it will just have to try what Keynes recommended, and start learning to manage the consequences of population decline. Obviously there is more, much more, to be done in Southern Europe, but trying to look for the problem where it isn’t won’t help in that endeavor. 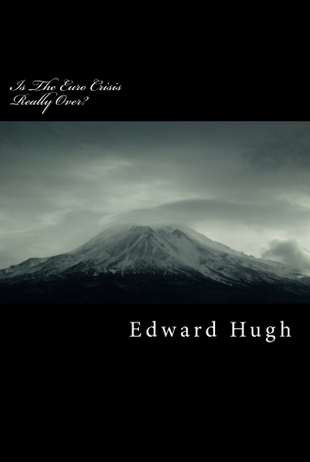 The above arguments are developed in detail and at far greater length in my new book “Is The Euro Crisis Really Over? – will doing whatever it takes be enough” – on sale in various formats – including Kindle – at Amazon.